Quality Score is one of Google AdWords’ greatest mysteries. Apparently, there are more than 100 factors that can affect quality score but not all factors are triggered in every instance. It’s not an easy puzzle to solve, and while it might seem exceptionally confusing at times, there are few secrets to success that can help you earn a higher quality score and subsequently rank higher and have your ads appear more easily at the top of Google’s first page. Thanks to industry leader Brad Geddes, named one of the top 25 most influential PPC experts, here is a great overview of quality score and its effect on ranking. Quality score measures the imagined experience a searcher will have with your ad copy and landing page for each keyword and is recorded with a 1 to 10 number assigned by Google. Quality score is one of the determining factors in regards to whether or not your ad will appear on the first page of Google, what its ad position will be, whether or not site links will appear and more. If you want your ad to reach the top spot in search, it’s a combination of bids, quality score and ad extensions, with quality score and bids sharing most of the pie. 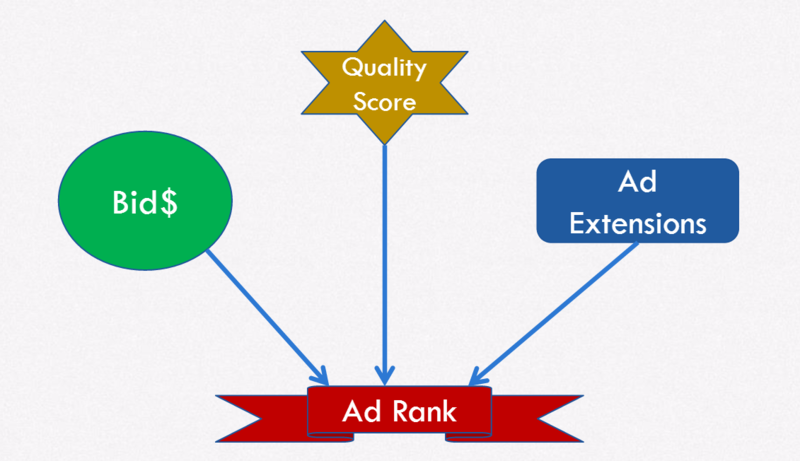 The three factors that determine your ad’s rank (or lack thereof) do not have equal weight. While it’s not clear the exact value of each, let’s imagine the weighting is as follows. If what you bid is half the deciding factor for your ad’s ranking, your quality score is 40% of the battle, and ad extensions count for 10%, then here is how your ad would rank in various situations. 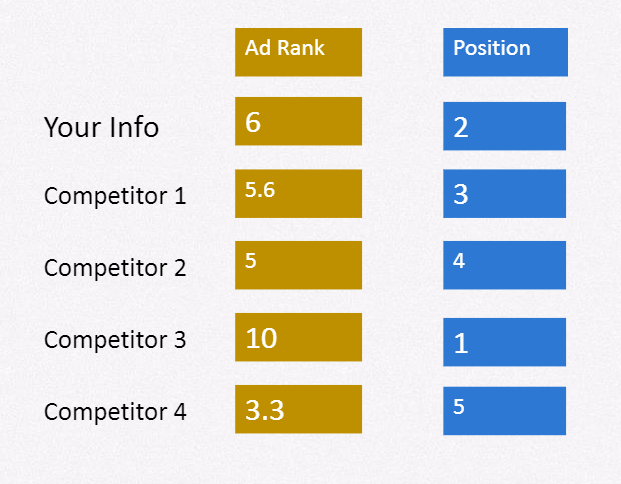 Once you have an ad rank calculated, the position is determined. If you want the top spot, like Competitor 3, you need to have a good quality score (or a perfect 10 quality score) and set your max bid reasonably. If you have a weak spot in one of the area, like Competitor 3 did with Ad Extensions, it’s important to make up for it with other determining factors. When you first launch ads, before you have any data, there is still a quality score displayed. That quality score is that of your competitors, so it’s a good idea to take note of that quality score so that once you start collecting data and your own quality score appears, you can compare the two to see if your ads are performing below or above your competitors. If you are running an ad on mobile and desktop, the quality score that appears will be an average of the mobile and desktop quality score. For example, if your quality score on mobile is 2 and your quality score on desktop is 10, your average would be 6. A quality score of 6 could be improved, but it is nowhere near as alarming as a quality score of 2, so you may not notice the importance of improving this ad campaign. In this case it may be more efficient to separate mobile and desktop campaigns to avoid this situation. Overall, it’s important to dig deep, especially with Mobilegeddon behind us. If you have any questions about quality score or ad rank, ask them in the comments below. Or better yet, ask Brad in person at the Acquisio Summit!